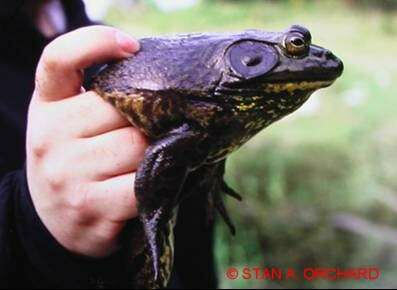 How do you tell a male American bullfrog from a female? For one thing, only the males vocalize. 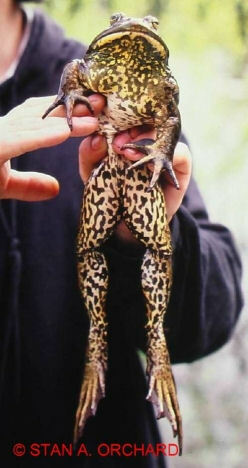 Adult male bullfrogs are large, muscular and vocal. They are easily distinguished from females by the very large tympanic membranes that cover their ears. These are much bigger in diameter than their eyes. In females, the tympanic membrane is about the same diameter as the eyes. The chins of males are darkly pigmented, with a distinctive yellow mottle. The chins of adult female frogs tend to be more uniformly white. 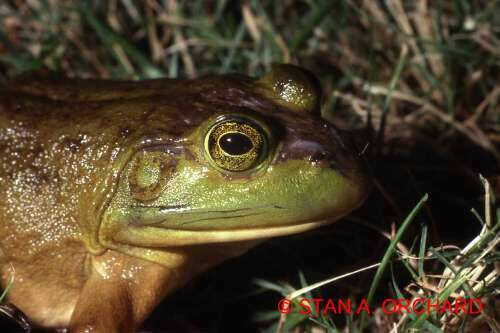 Adult female bullfrogs have an eardrum - tympanic membrane - that is about the same size as the eye. It is significantly smaller than that of an adult male (see above). The skin below the mouth and on the throat is generally white in adult females, while an adult male’s throat is more darkly pigmented with black and yellow. Females do not vocalize.